The ripped and distressed jeans are back on trend this year. In today’s article, I want to draw your attention to my favorite ways how to wear ripped denim pants and look awesome. If you do want to know how to make your distressed jeans look posh and polished then you are more than welcomed to view this post. Of course, you have to forget about wearing them to the office and formal events, but you can try these looks at cool parties and for chic street style walks. Anyway, here are some of my favorite tips and tricks how to look polished in ripped jeans. If you do not wish to look slobby, then you better avoid wearing more than one slouchy piece at a time. Don’t go too much relaxed looking, otherwise, you gonna look like a hobo. 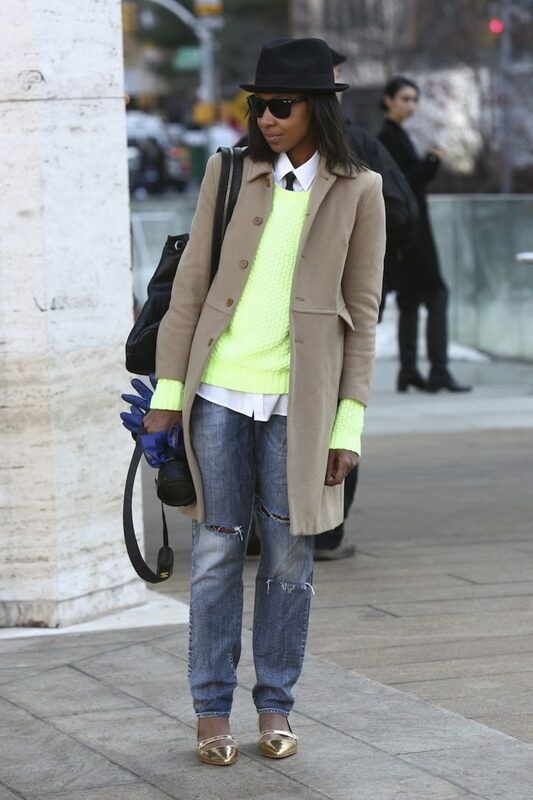 While wearing ripped jeans, you should keep the rest of your outfit look polished. For instance, you can pair the striped long-sleeve top with your favorite slim distressed jeans and finish the look by adding yellow pumps or keep it cool with skinny knee-ripped jeans and relaxed fit semi-sheer silken blouse. 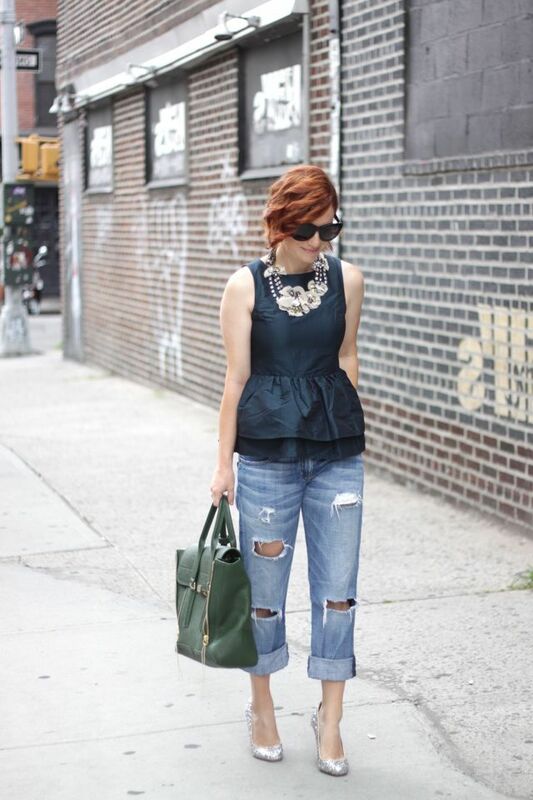 You can make things look awesome by adding a dressy top paired with your favorite ripped jeans. For instance, you can try on sleeveless peplum black top and team it with cuffed and ripped boyfriends, or try on white lace T-shirt and team it with distressed slim-fit denim pants. Personally, I do love wearing a blazer with my favorite ripped jeans. The suit jacket gives a professional vibe that makes me look sophisticated and trendy. If you want to keep things more casual and edgy, then you might like to try on a leather jacket. You can pair black leather topper with simple white top and knee-ripped jeans, or make things simple by wearing a black leather jacket with a slouchy grey T-shirt half-tucked in ripped boyfriends. Lots of ladies want to achieve a simply chic look. You can create such outfit by adding a basic plain white tee. This top will create an instant model-off-duty look. If you want to achieve a Tomboyish twist, then I recommend trying to team your ripped jeans with a stylish sweater, graphic shirt and a pair of cool looking sneakers. An edgy look for women who want to keep things relaxed and still eye-catchy! Love the black leather jacket worn with knee-ripped slim jeans and beige pumps, the leopard print tote bag ideally matches this outfit. Speaking of prints, I made a post about leopard print clothes and accessories, check it out, as there are lots of ways how to wear this wild style on the streets. Wow, that’s a stunning outfit for casual street walks, we see a snake printed green sweater paired with knee ripped blue washed jeans and camouflage print sneakers. I made a nice blog post about ways how to wear sneakers for women, there are gathered amazing ideas how to style this sporty footwear in real life, check it out and let me know your thoughts. Do You have any thoughts about Ripped Jeans For Women? Here are Fashion Tips pictures and trendy women’s outfits which are in style in 2019: Denim, Denim Trends For Women, Distressed Jeans, Ripped Jeans, Street Style Women's Fashion And Inspiration and tips on how to wear them on the streets.